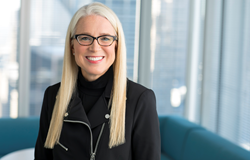 Network of Executive Women President and CEO Sarah Alter will join retail and consumer goods executives for a learning and networking event celebrating the 10th Anniversary of NEW Chicago. The event includes a panel discussion on retail technology. Sarah Alter, president and CEO of the Network of Executive Women, will be a featured speaker at the 10th anniversary celebration of NEW Chicago, August 24. The Network of Executive Women’s recently named President and CEO Sarah Alter will be a featured speaker at the 10th anniversary celebration of NEW Chicago, Thursday, August 24. NEW is the largest women’s leadership organization serving the North American retail and consumer goods industry, and NEW Chicago is one of its largest regional groups. During the event, at Wrigley Company’s U.S. headquarters, Alter will outline NEW’s mission and honor founding members of NEW Chicago, including Meena Patel of SAP, Kim Feil of bizHive.com, Amy Oates Fitzgerald of Catalina, Kelly Muno of Coty and Alison Kenney Paul of Deloitte. The evening will include a panel discussion on retail technology. Founded in 2001, the Network of Executive Women, Retail, Consumer Goods and Services, represents more than 10,000 members, 950 companies, 100 corporate partners and 20 regions in the U.S. and Canada. For more information about the Network of Executive Women and its North American and regional learning programs events and best practices, visit newonline.org.